Encaustic (pressed cement) tiles are hand made, as they have been for over a hundred years. The coloured face is made from crushed marble and granite, colour pigment and cement. The result is a slightly chalky appearance when new, that will wear beautifully to a smooth and silky patina. Subtle colour variation from tile to tile is normal. Encaustic tiles are available as single colour tiles or in a range of polychrome patterns and can be used together in many combinations to create classic or exciting original designs. 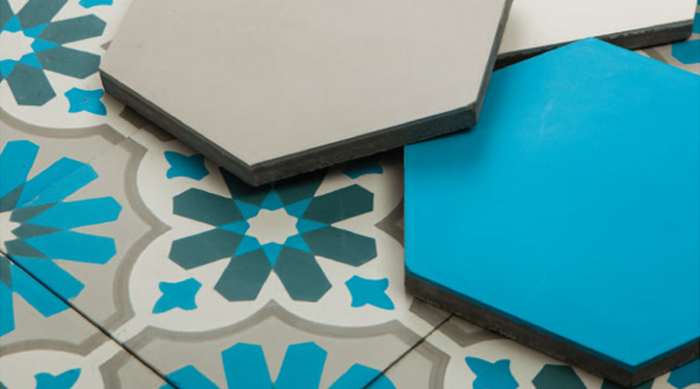 These tiles are well suited to internal floors and walls, including kitchens and bathrooms, retail & hospitality walls and counter fronts, or any area requiring impact. This collection is hard wearing and can be used outside under cover however colours may fade naturally in our strong UV light. This range of tiles should be sealed with a water-based penetrating sealer, such as Aqua-Mix Sealers Choice Gold. Click here for more information on this collection.